Heiken Ashi is a very well known indicator. Instead of using "raw" prices" for calculations, it's using smoothed/filtered/averaged prices instead. That usually filters out some false signals and makes it easier to use. Linear weighted moving average (LWMA). Additionally you can use a "step" filter (in pips) to filter out value changes that are smaller than the desired threshold (if the step is set to <=0, then that filter is not used). ADXVMA indicator made as "binary" having only two values (+1 for "trend" up and -1 for "trend" down). In this version of Accumulative Swing Index Smoothed indicator we are introducing a sort of levels that can be used for trend assessment. 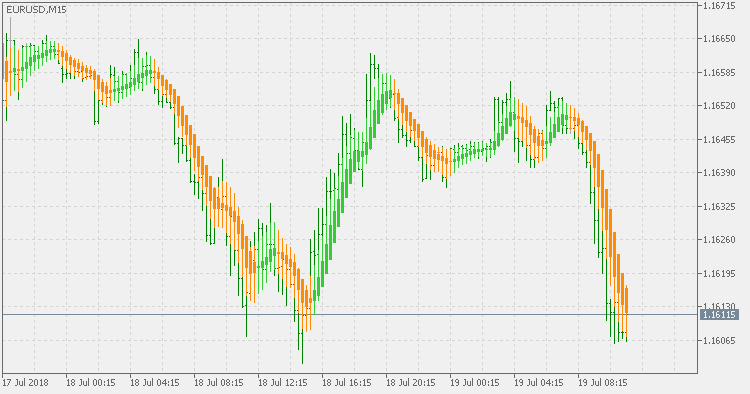 Unlike the Heiken Ashi Smoothed, this indicator is displaying 2 values only: +1 for trend up and -1 for trend down, thus making it suitable for usage from experts. This indicator is a variation of a well known WPR (Williams Percent Range) indicator with 4 WPR values combined into "candles".